An increasing function f : R n → R ∪ +∞ is a function such that f(x′) ≥ f(x) whenever x′ ≥ x (component-wise). A downward set G ⊂ R n is a set such that x ∈ G whenever x′ ≥ x for some x′ ∈ G. We present a geometric theory of monotonicity in which increasing functions relate to downward sets in the same way as convex functions relate to convex sets. 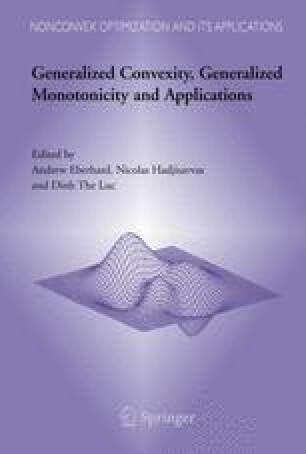 By giving a central role to a separation property of downward sets similar to that of convex sets, a theory of monotonic optimization can be developed which parallels d.c. optimization in several respects.